One night in the early ‘70s. It is past midnight. The stage is set. The crowd waits in anticipation. Gene Ang and his Hawaiian Crackers are playing popular Hawaiian music of the day, performing for one night only at the Chinese New village in Taiping for the legendary striptease artiste, Rose Chan. Suddenly she appears from behind the curtains. The band works hard to keep their music in tempo to Rose’s moves as she gyrates and teases her audience. Unbeknownst to the audience, Rose is wearing three pairs of undergarments. Excitement builds as Rose takes off the first of three of her brassieres and swings it to the audience. She then takes off her second brassiere and again throws it to the crowd. And just as Rose is removing her third brassiere, Gene snaps a string of his lap steel guitar. It was all too much for him. Gene Ang (2nd from the right) and his Hawaiian Crackers in the late ‘50s. 1958: What do a postman, surveyor, storekeeper, optical shop assistant and bank teller have in common? Nothing much, except that they all were all once members of the same band! 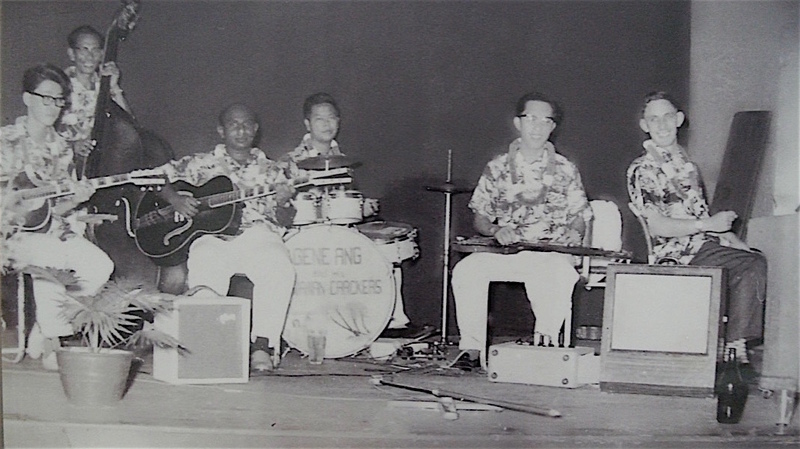 Gene Ang and his Hawaiian Crackers was the only performing band in Taiping from the late ‘50s up to 1976. The band comprised of Gene’s neighbour, Zain, who was a postman; Poh Kee who worked in Chartered Bank (now known as Standard Chartered Bank after the 1969 merger with Standard Bank); Singgam, an Army storekeeper; ‘T.A.’ who worked in an optician’s; and Gene whose day job was with the Government Survey Department. Hawaiian songs and the hits of Elvis Presley were very popular back then so the band concentrated on playing these songs. Most of the music was learnt by ear after listening to vinyl records. They did not have the luxury of music sheets. As the only band around, Gene Ang and his Hawaiian Crackers was in high demand performing at weddings, private evening functions and birthday parties. And during the weekends, they sometimes performed for doctors’ private functions, the police inspectors’ mess, nurses’ dances, and in private clubs. The band even played at the cinema before showings of Elvis Presley movies. One of Gene’s fondest memories is performing in the band which was chosen to play during the opening of Parliament in 1962. Gene’s instrument of choice was the lap steel guitar (a.k.a. Hawaiian guitar), but he could play almost all stringed instruments including the guitar, ukulele, double bass, mandolin, and violin, as well as the gendang (double-headed drum). How and when did Gene develop this passion for playing and performing? 1929: Ang Leong Tooi was born in Ipoh to a Baba family from Medan. He would later adopt the name Gene after Gene Autry, the Singing Cowboy who was popular in the 1940s. Gene’s father worked as a Chief Customs Officer while his mother tended to their six children. Even from the early age of five, Gene was drawn to music. His first instrument was the violin, which he learnt to play from a Ronggeng (Javanese dance) troupe. 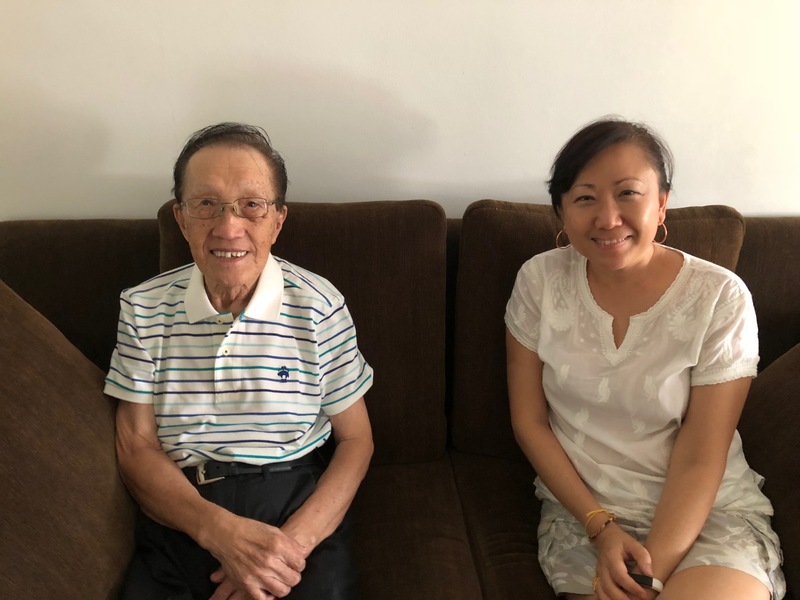 His family moved to Teluk Intan when he was 7 years old where he was introduced to a friend of his father who played for a Chinese Opera troupe in Taiwan. From him, Gene learned to play the big drum and also observed how to lead a band. But life took a different turn in 1942 during the Japanese Occupation when most of the schools and shops were closed, a period where Gene also stopped playing music. 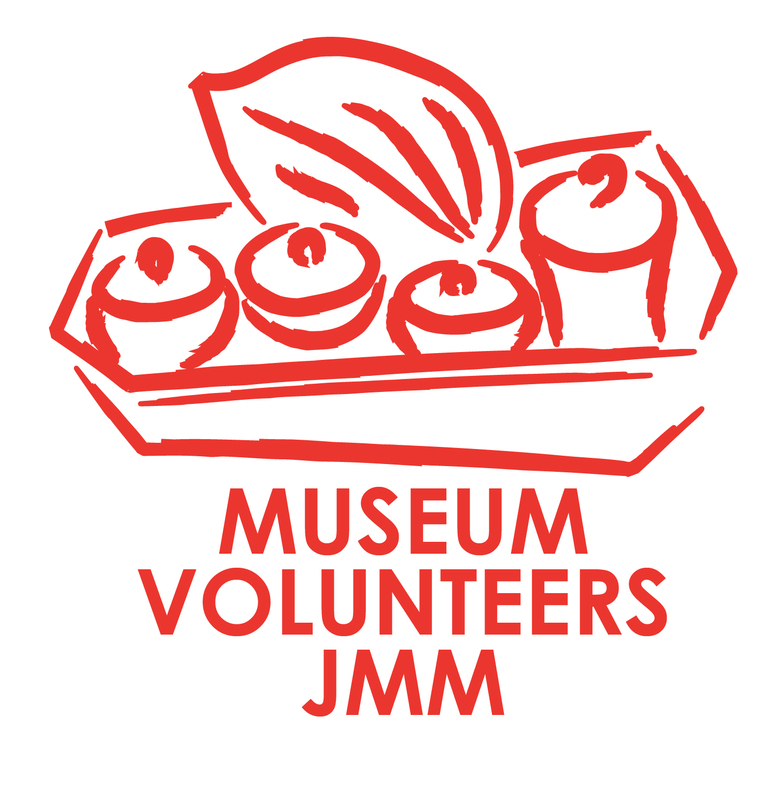 In 1943, his family moved to Taiping. After the war, Gene resumed his studies at the King Edward School there (now SMK King Edward VII), starting Standard 4 at the age of 17 years old. He would later complete his education at the age of 20 years in Penang in 1949. Sadly, Gene’s father fell ill in December the same year and passed away at the beginning of 1952. With no means of supporting himself through further education, Gene joined the Government Survey Department in Taiping and worked his way up to be a land surveyor. Photo taken at Town Hall in Taiping during a party for the Survey Sports Club. It was popular then to hire girls from Kampung Pinang as dance partners for joget and ronggeng. The dancers were paid RM15 per person and the band would get RM200. Gene is playing the lap steel guitar in this photo. As luck would have it, soon after the war, while Gene was still at school in Taiping, he met Emile Nicholas who later became a Major (then Colonel) in the army. The duo played guitar at weekly Saturday campfires and sing-a-longs. It was also during these weekly campfires that Gene met his future wife, Judy Foo, who was only 15 years old when they met. She was his sister’s classmate. They dated for 7 years before getting married in 1954. In the early ‘50s, Gene was invited to play for the British at the Military Club, the Australian and New Zealand clubs in Kamunting, the Customs Recreational Club, and the New Club near Lake Gardens in Taiping. 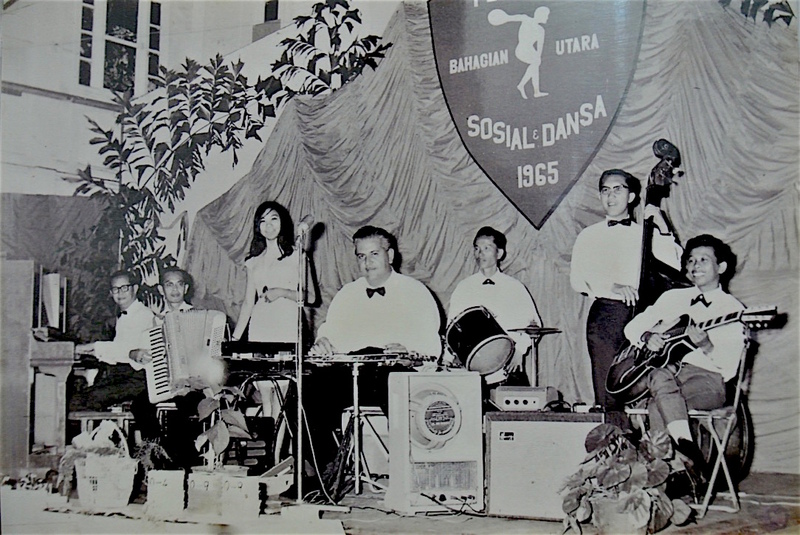 When Nicholas was transferred to Ipoh, he invited Gene to play the double bass in his band at St. John’s Red Cross Hall and at joget (traditional Malay dance) dances in Perak. After his experiences in Nicholas’ band, Gene finally formed his own troupe in 1958, calling themselves The Hawaiian Crackers with Gene Ang as the band leader. The band performed together until 1976 when Gene had to move to Pahang as the land surveyor for a Federal Land Development Authority (Felda) scheme. 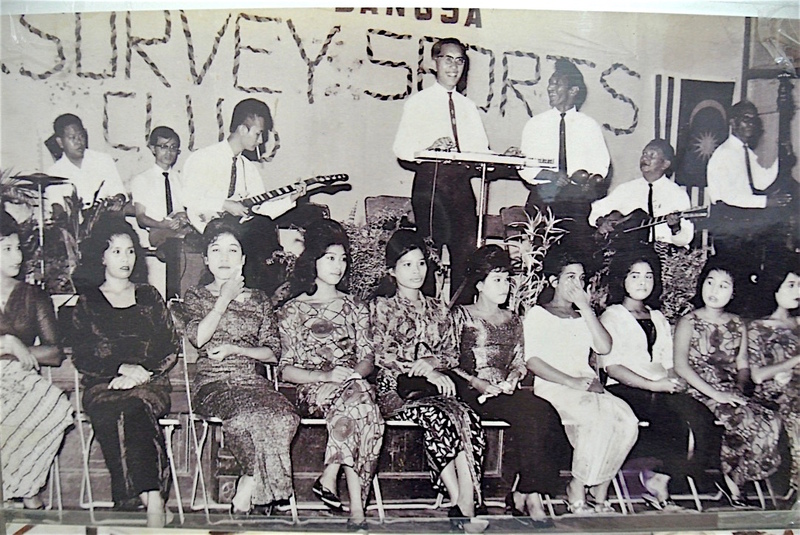 Photo taken in 1965 at the Town Hall in Taiping for Perak Amateur Athletic Association (AAA) with Gene (2nd from the right) playing the double bass, Sultan Idris’ brother on guitar and Nicholas playing the lap steel guitar. Gene still remains sprightly and full of energy to this day. He does his daily exercises by walking every morning and evening. After he stopped playing music, his passion turned to cooking and baking.